An ambitious project to generate tidal energy in Scotland requires some very specialised electronics, reports Sally Ward-Foxton. A huge project to install tidal turbines to generate electricity off the coast of Scotland is set to generate 86MW by 2020. There is potential for turbines to generate 398MW, enough to power 175,000 Scottish homes from the same tidal energy farm once the project is fully rolled out. 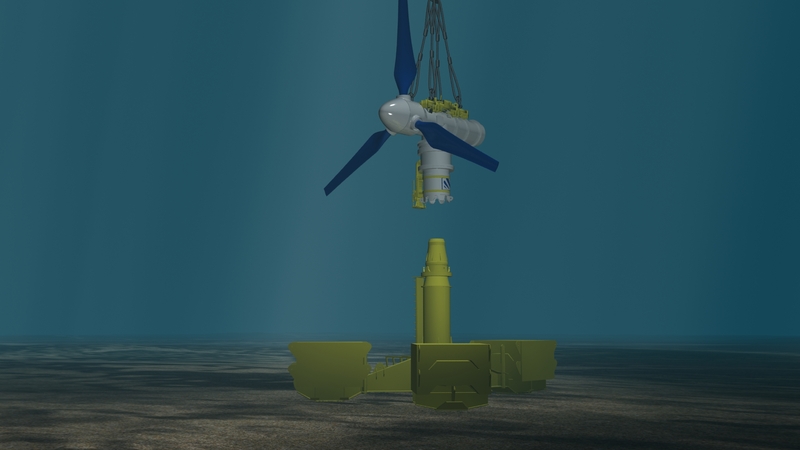 Phase 1A of the MeyGen project, in the Pentland Firth where tidal flow can reach 5m/s, will see four 1.5MW demonstrator turbines installed under the sea to harness the power of the tides. Tidal turbines can produce similar efficiency to wind turbines, with the MeyGen turbines expected to deliver up to 40% ‘water-to-wire’ overall efficiency. However, unlike wind, tides have the advantage of being predictable. This means the turbines can produce the full 1.5MW of power for a larger proportion of the time - MeyGen’s load factor is expected to be around 40%, compared to a wind farm’s typical load factor of 20-25%. This also means that the amount of energy, and therefore, revenue for the tide farm can be estimated very accurately over the lifetime of the turbines (25 years). 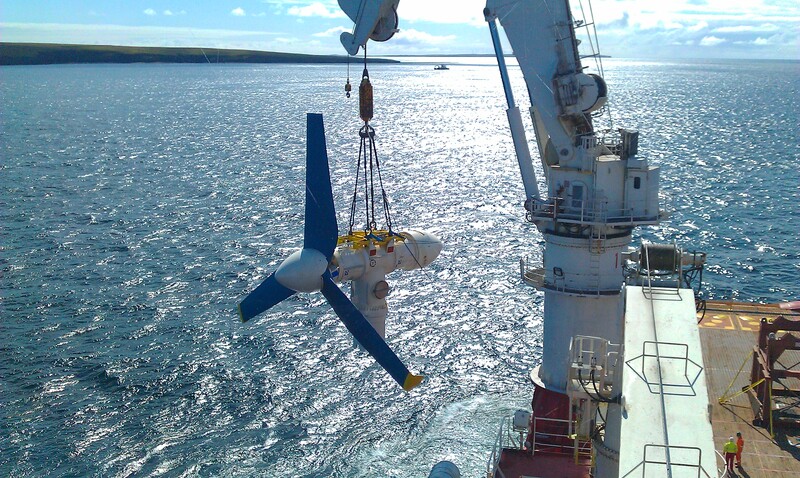 Figure 1 - An AR1000 tidal turbine is deployed at the European Marine Energy Centre in Orkney. 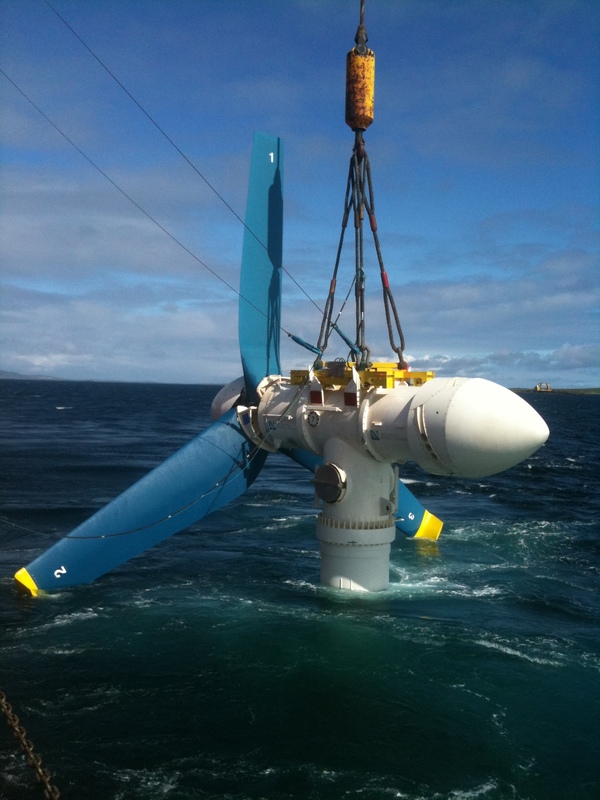 The turbine section is carefully lowered into the water from the deck of the installing vessel using its crane. The tidal turbine technology is based on today’s wind farms, with some key differences to account for the sub-sea environment, explains David Taaffe, Head of Electrical Systems for the project. Placing the frequency converters in an on-shore power conversion centre means they are more easily accessible for operation and maintenance purposes. Each turbine then requires a 2.5km cable to it, whose installation impacts the economics of the project. However, compared to the cost of performing sub-sea maintenance (the maintenance vessels can cost anywhere between £30,000 and £70,000 a day, according to Taaffe), it’s seen as an acceptable compromise. Having separate cables to each turbine also means that each turbine is independent - if a fault was to switch off one turbine, the rest of the farm would be unaffected. Figure 2 - A series of guide wires are used to control the orientation of the nacelle, enabling the accurate alignment of the nacelle with the base substructure. The turbine’s frequency converter has two functions. Firstly, it’s a rectifier for the power coming from the generator in the turbine, which delivers various power levels at variable frequencies (between 200kW and 1.5MW and between 10 and 50Hz, depending on prevailing tidal conditions). Rectifying it to DC, it can then be easily reconverted to 50Hz, 33kV so it can be linked to the grid from there. The medium-voltage frequency converter runs at 3.3kV in order to overcome losses in the 2.5km cable. Secondly, the frequency converter has an inverter which is used to drive the system which controls the torque coming from the generator. “Because of the nature of tidal flows and water turbulence, each turbine has to be kept tightly controlled to stop it from going over speed or vibrating too much,” Taaffe says. Torque control is required to limit the power output of each turbine to 1.5MW, because that’s the level to which the components are rated. At the same time, the generators have an optimum RPM in order to extract maximum power from the tide. Torque control is achieved through adjusting the pitch of the turbine blades. The system is again based on proven wind farm technology, but with modifications made for the under-sea environment. Figure 3 - The turbine section is lowered directly onto the already installed base section using underwater cameras for guidance. The whole thing is weighted down to the sea bed with large ballast. Each of the three pieces of ballast weighs 200 tonnes, as that is the limit of the transporting equipment. Clearly, the algorithm for wind turbines is not going to work under the sea, because it needs to be tuned for the inertia of the system and for water dynamics as opposed to air dynamics. Factors like the time it takes to adjust the pitch and the acceleration of the blades all needed to be tuned in the real environment, and that has been achieved at the European Marine Energy Centre in Orkney, where a number of turbines have been tested and proven with the pitch controller. Figures 1 and 2 show a demonstrator being installed at EMEC, with Figures 3 and 4 showing an illustration of the same turbine during installation and in place on the sea bed. Figure 4 - The turbine rests on the base using a simple gravity-based mechanism, which requires no bolts or clamps. It’s ready for operation within 60 minutes of leaving the deck of the vessel. The demonstration phase of the MeyGen project will actually use two completely different tidal turbine designs, which will be evaluated. Three turbines will be supplied by Andritz Hydro Hammerfest, the HS1000 model, and one turbine will be supplied by Atlantis, the AR1000 (Figure 5). Both turbine types have been designed to fit the design envelope shown in Figure 6, but they have very different electrical systems. Andritz Hydro Hammerfest’s design for the HS1000 uses an induction generator, while the AR1000 from Atlantis uses a permanent magnet generator. Each has pros and cons, explains Taaffe. “The permanent magnet generator is more efficient, the induction machine is a bit more lossy, but the permanent magnet machine is probably slightly less robust than the induction machine,” he says. The superior efficiency of the permanent magnet generator design is down to the fact that for a given power, the permanent magnet generator is smaller than the induction machine. This means that the permanent magnet machine can be made larger without compromising the constraints on the diameter of the nacelle, so it can be run at slower speeds. This means the permanent magnet generator needs only a two-stage gearbox, compared to the induction generator’s three-stage gearbox, improving the overall efficiency of the design. 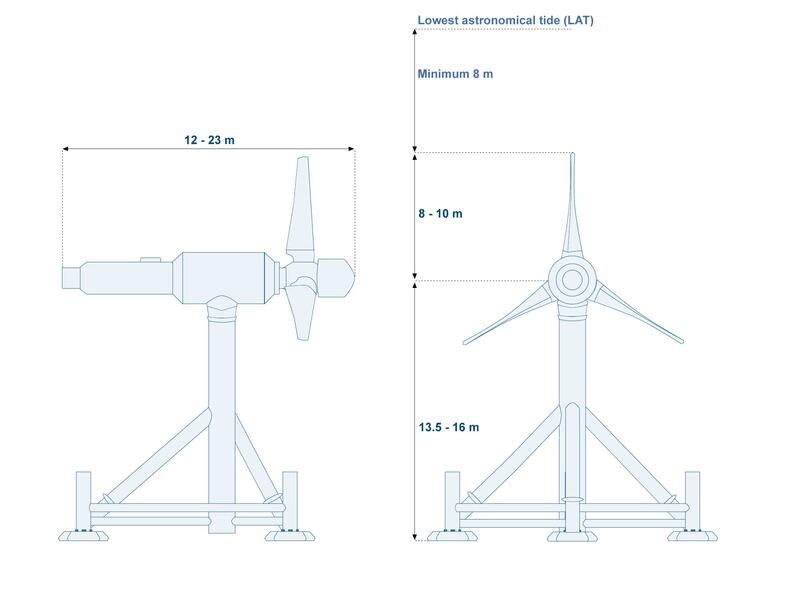 Figure 5 - The two types of turbine chosen for Phase 1A of the project are the Atlantis AR1000 and the Andritz Hydro Hammerfest HS1000. The waterproof nacelle of this design has air inside, and the components are cooled with oil that travels down pipes to an external heat exchanger, which dissipates the heat generated into the sea water. Testing has proven that actively cooling the major components in the system works well, but because it uses electronics in such an inaccessible location, it does require redundancy in terms of additional power supplies and controllers. Atlantis’s design is going to be passively cooled; since the nacelle is smaller and the case thinner, the components are closer to the seawater passing over the structure. The case is filled with oil, and when the shaft rotates, it circulates the oil around the structure, allowing heat to be transferred from the magnets and coil to the oil, then to the outer casing and out into the seawater. Taaffe points out that a key benefit for tidal systems is that the highest power levels, and therefore the highest levels of heat to be dissipated, occur when the water is flowing fastest, so it lends itself to passive cooling. The blade pitch systems are also different. In Andritz’s design, the pitch of each blade is controlled individually, with each blade having its own motor and gears. Electronics is used to control the pitch angle, with each blade having a frequency converter to drive the motor (in fact, there are two frequency controllers per blade, for redundancy). The Atlantis design has a collective pitching system whose mechanical gears pitch all three blades at the same time. This system is hydraulic, with an electric motor to repressurise the hydraulics. Figure 6 - The design envelope for the turbines, showing the major dimensions. Installation of the four turbines for Phase 1A of the project in the Pentland Firth will commence in 2015. If everything goes to plan, the completion of Phase 1 (parts A, B, C and D) will result in 57 turbine installations giving the wind farm a capacity of 86MW by the end of 2020.